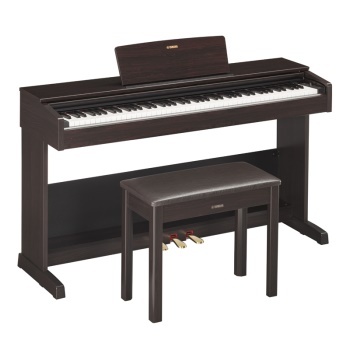 SUPERB PLAYABILITY AND FEEL: The Graded Hammer Standard (GHS) 88-key piano keyboard provides a heavier touch in the low end and lighter touch in the high end, replicating the feel of the hammers inside an acoustic piano. GHS is great for the aspiring pianist, because it can help you build proper finger technique. When it comes time to play the real thing, your hands will be ready! Additionally, the matte finish of the black keys can absorb moisture from your hands, making them less slippery even after hours of practice. QUICK AND EASY ACCESS TO YOUR FAVORITE FEATURES BY USING AN APP: The "Digital Piano Controller" app has an attractive interface optimized for iOS touch screens, and adds a whole new level of functionality to the YDP-103. You can turn your iOS device into an intuitive instrument controller, allowing you to access features and settings even more quickly than using the panel of your instrument. Adjust settings, choose Voices, and even record performances. Once you try it, you'll never want to play without it! DISCOVER AN INSPIRING COMBINATION: Combine two Voices together, like piano and strings, for an inspiring new playing experience. Nothing livens up piano practice like playing a piece with a new sound, or creating unique combinations of two sounds together. Experiment with your combinations to discover fresh and inspiring tonal colors. CONNECT AND INTERACT WITH YOUR INSTRUMENT: A standard USB cable can be used to connect the instrument to a computer or mobile device, opening up a world of creativity, entertainment, and education. iOS devices can be connected to the instrument using the Yamaha UD-BT01, or the Lightning-USB Camera Adaptor. The instrument can be used to interact as a controller and/or sound source with a variety of music creation applications.